Started 41 of the 76 games in which he appeared for the Brooklyn Nets and averaged 7.7 points (.389 FG%, .857 FT%), 2.3 rebounds, 1.1 assists and 21.3 minutes…missed two games due to injury/illness and was a DNP-CD on four occasions…missed one game (Nov. 22 vs. Boston) due to a migraine and one game (Mar. 13 vs. Milwaukee) due to an upper respiratory issue…was the recipient of the J. Walter Kennedy Citizenship Award which is named after the NBA’s second commissioner and is presented by the Professional Basketball Writers Association annually to the player, coach or athletic trainer who shows outstanding service and dedication to the community…set single-season career highs in three-point field goals made and attempted, steals and starts…ranked second on the Nets in three-point field goals made and attempted, third in starts and fourth in steals…topped the Nets in scoring twice and in steals on 11 occasions…scored in double figures 28 times, including a pair of 20-point efforts…hit at least one three-point field goal in a career-high 14 consecutive games from Jan. 20-Feb. 21…recorded a single-season career-high 12 multi-steal games…started a career-high 31 consecutive games from Jan. 11-Mar. 22…had season highs in points (26) and rebounds (7) and matched his career high with seven three-point field goals made at Miami on Dec. 28…scored his 3,000th career point at Philadelphia on Feb. 6…played his 400th career game on Dec. 14 vs. Orlando…Season Highs: 26 points (at Miami, Dec. 28), seven rebounds (at Miami, Dec. 28), four assists (three times), three steals (vs. Miami, Dec. 16), one block (five times) and 35:41 minutes (at Utah, Feb. 27). 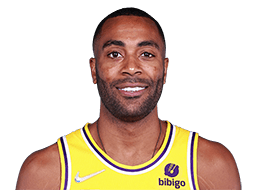 Appeared in 65 games (36 starts) for the Los Angeles Lakers and averaged 10.0 points (.412 FG%, .813 FT%), 3.2 rebounds, 1.6 assists and 25.8 minutes…missed nine games due to injury, six games (Nov. 11-19) due to personal reasons and two games as a DNP-CD (Jan. 13 and 15)…missed the season opener (Oct. 28) due to a concussion…sat out the final eight games of the season (Apr. 3-15) due to a right shoulder separation…set single-season career highs in points, scoring average, field goals made and attempted, defensive and total rebounds, rebounds per game, assists, assists per game and minutes played…led the Lakers in three-point field goal percentage and was second in three-point field goals made and attempted…topped the Lakers in points three times, in minutes 17 times, in steals on seven occasions and in rebounds, assists and blocks one time each…scored in double figures a career-high 34 times, including three 20-point efforts…grabbed double-figure rebounds once and posted one double-double…recorded a single-season career-high 28 multi-trey games…posted his first career double-double with 15 points and a career-high 10 rebounds at Utah on Feb. 25…set career highs in points (28) and field goals made (12) and attempted (20) vs. Washington on Jan. 27…scored his 2,000th career point vs. the Clippers in Los Angeles on Oct. 31…Season Highs: 28 points (vs. Washington, Jan. 27), 10 rebounds (at Utah, Feb. 25), six assists (vs. Oklahoma City. Mar. 1), three steals (vs. Washington, Jan. 27), one block (twice) and 46:10 minutes (vs. Chicago, Jan. 29). Saw action in 45 games (one start) for the Dallas Mavericks and averaged 3.2 points (.437 FG%, .909 FT%), 1.0 rebounds and 8.7 minutes…missed three games due to injury and was a DNP-CD on 34 occasions…sat out one game (Nov. 12) with a right thigh contusion and two games (Dec. 28 and Jan. 10) due to illness…topped the Mavs in steals once…scored in double figures three times…played his 300th career game on Feb. 26 vs. New Orleans…Season Highs: 12 points (twice), six rebounds (vs. Orlando, Jan. 13), four assists (at Philadelphia, Feb. 21), three steals (at Phoenix, Dec. 21), one block (twice) and 22:49 minutes (vs. Milwaukee, Dec. 14). Split the season between the Memphis Grizzlies and Cleveland Cavaliers and averaged 7.9 points (.427 FG%, .907 FT%), 2.1 rebounds, 1.3 assists and 21.3 minutes in 78 games (21 starts)…sat out one game (Mar. 15) with a left lateral ankle sprain and one game as a DNP-CD…set single-season career highs in games played and free throws made and attempted…scored in double figures 29 times, including a career-high four 20-point performances…appeared in 40 games (four starts) for the Grizzlies and averaged 5.5 points (.407 FG%, .938 FT%), 1.3 rebounds, 1.1 assists and 16.9 minutes…topped the Grizzlies in scoring twice and in blocks once…saw action in 38 games (17 starts) with the Cavaliers and averaged 10.4 points (.439 FG%, .898 FT%), 3.0 rebounds, 1.6 assists and 25.9 minutes…topped the Cavs in scoring four times and in steals on seven occasions…recorded a steal in a career-high five consecutive games from Mar. 18-29…played his 200th career game on Nov. 23 against the Lakers…scored 25 points and hit a career-high seven three-point field goals vs. Miami on Nov. 11…Season Highs: 26 points (at Sacramento, Jan. 7), seven rebounds (vs. Miami, Mar. 20), five assists (vs. New York, Apr. 12), three steals (four times), one block (three times) and 41:16 minutes (vs. Miami, Mar. 20). Appeared in 51 games (four starts) for the Minnesota Timberwolves and averaged 6.1 points (.404 FG%, .800 FT%), 1.9 rebounds and 19.1 minutes…missed a pair of games (Apr. 11-12) with back spasms and was a DNP-CD on 13 occasions…scored in double figures 16 times…Season Highs: 17 points (twice), seven rebounds (twice), four assists (at Sacramento, Apr. 2), three steals (three times), two blocks (at Dallas, Jan. 25) and 38:30 minutes (at Dallas, Jan. 25). Saw action in 62 games (eight starts) with the Timberwolves and averaged 6.6 points (.403 FG%, .792 FT%), 1.7 rebounds, 1.2 assists and 19.0 minutes…missed three games (Nov. 12-15) with a bruised left thigh…was a healthy scratch on the inactive list three times and a DNP-CD on 14 occasions…led the team in scoring three times and in assists once…scored in double figures 15 times…Season Highs: 18 points (twice), seven rebounds (vs. Washington, Jan. 13), five assists (twice), two steals (four times), one block (three times) and 40:23 minutes (at Washington, Mar. 5). Appeared in 76 games (one start) for Minnesota and averaged 6.6 points (.424 FG%, .871 FT%), 2.1 rebounds, 1.0 assists and 18.2 minutes…missed one game (Apr. 7 vs. Golden State) with an upper respiratory infection…was a healthy scratch on the inactive list three times and was a DNP-CD twice…set a single-season career high in offensive rebounds…was fourth on the team in both three-point field goals made and attempted…led the team in scoring and assists two times each…scored in double figures 17 times…made his first career start on Nov. 9 at Golden State and tallied seven points, two rebounds, one assist and one steal in 16:32 of action…made his NBA debut on Oct. 28 and had eight points, six rebounds and two assists in 23:13 of action vs. New Jersey…Season Highs: 17 points (four times), seven rebounds (at New Jersey, Dec. 23), five assists (at Indiana, Jan. 2), three steals (at Phoenix, Nov. 1), one block (five times) and 34:37 minutes (at Houston, Jan. 13). 2017-18: Participated in the Three-Point Shooting Contest at All-Star Weekend…2015-16: Was the recipient of the J. Walter Kennedy Citizenship Award. Played three seasons at the University of North Carolina before becoming an early entry candidate for the 2009 NBA Draft…was one of four Tar Heels selected in the 2009 NBA Draft joining teammates Tyler Hansbrough, Ty Lawson and Danny Green…appeared in 115 games (112 starts) and averaged 14.7 points (.463 FG%, .397 3FG%, .809 FT%), 4.1 rebounds, 2.2 assists and 28.5 minutes…finished his career ranked second in UNC history with 229 three-pointers made…was named the Most Outstanding Player of the 2009 Final Four after leading UNC to the NCAA Championship…set the Final Four record for highest three-point field goal percentage after hitting eight of his 10 attempts (.800)…earned All-ACC Tournament honors in each of his three seasons…finished his career with 1,694 career points…as a junior in 2008-09, he averaged 15.8 points (.483 FG%, .777 FT%), 4.9 rebounds, 2.7 assists and 30.4 minutes in 38 games (37 starts) and earned Honorable Mention All-ACC honors…led UNC in three-point field goals made with a career-high 85, the fifth-best single-season total in school history…ranked among the ACC leaders in three-point field goal percentage (3rd), three-pointers made per game (6th), field goal percentage (8th) and scoring (13th)…as a sophomore in 2007-08, he averaged 16.6 points (.467 FG%, .826 FT%), 4.5 rebounds, 2.0 assists, 1.13 steals and 31.1 minutes in a career-high 39 games (38 starts) and earned Second-Team All-ACC honors...earned All-East Regional honors to help lead the Tar Heels to the Final Four...led UNC with 18 points in their Final Four loss to Kansas…was a two-time ACC Player of the Week…led the Tar Heels in three-pointers made and was second in scoring average…ranked sixth in the ACC in field goal percentage and seventh in scoring average…scored a career-high 36 points and hit the game-winning shot at 19th-ranked Clemson on Jan. 6…as a freshman in 2006-07, he averaged 11.7 points (.433 FG%, .836 FT%), 2.9 rebounds, 2.1 assists and 23.9 minutes in 38 games (37 starts)…earned ACC Rookie of the Week honors in November…led the team in three-pointers made and ranked third on the team in scoring…the only game he didn’t start was Senior Night. Full name is Wayne Robert Ellington, Jr…goes by the nicknames “Weez” and “Weezy” which he received from friends…is the son of Wayne Sr. and Elaine Ellington…he and his wife Safiya have a son (Wayne Robert Ellington III)…has two older sisters (Ericka Ellington and Alexi Rae Ellington Webb)…lists his parents and his high school and college coaches as people that made a difference in his life…his parents because they taught him morals and values about life and his coaches because they instilled discipline and a work ethic in him…majored in communications at North Carolina…is very active in causes that aim to curb gun violence…was part of WPLG-TV’s Town Hall Meeting on Sept. 16, 2016 encouraging mentoring and ways to curb gun violence…was part of a rollout of the Sandy Hook Promise, the nation’s leading gun violence prevention program, at John A. Ferguson High School in Miami on Sept. 19, 2016…hosted the first Philadelphia Peace Games, along with Connor Sports, on Aug. 20, 2016 at Girard College after being moved emotionally after attending the Chicago Peace Games in 2015…the goal of the Philadelphia Peace Games was to bring at-risk youth and young adults together while emphasizing gun violence prevention and advocacy…the Philadelphia Peace Games were part of his “Power of W.E.” initiative, a campaign focused on the reduction of youth violence in Philadelphia communities through partnerships with existing gun violence prevention organizations and the City of Philadelphia…he created the initiative in his father’s honor, with W.E. representing the late Wayne Ellington Sr.’s initials…the “Power of W.E.” features strategic programming, with the purpose of uniting victims and sharing the message that “W.E.” as a community can work in unison to create change on a local and national level…became the first NBA player to collaborate with the U.S. Department of State and participate in the first-ever NBA-WNBA Sports Envoy Program in Cambodia from July 11-17, 2016 where he met with the Ambassador, Cambodian National Teams and conducted Jr. NBA basketball clinics…participated in Peace Day Philly in 2015 and marched with students from Parkway Northwest High School for Peace and Social Justice to commemorate International Day of Peace…has held his Make It Wayne Tournament in Pottstown, PA during the 2015, 2016 and 2018 summers…participated in the Seeds of Peace International Camp in the summer of 2009, working with Israeli, Palestinian, Egyptian, Jordanian and American youth to stress leadership and conflict resolution skills that apply on and off the court…lists his NCAA Championship rings as his most prized possession…when his playing career is over he would like to be involved in a business or real estate or possibly broadcasting…in his free time he enjoys being with friends and family, bowling, traveling and has recently started playing golf…his favorite sport other than basketball is football and his favorite team is his hometown Philadelphia Eagles…was a teammate of former 76ers guard Gerald Henderson at The Episcopal Academy…was a McDonald’s and Parade All-American at The Episcopal Academy…won the three-point contest at the 2006 McDonald’s All-American Game…led his high school to a 27-4 record his senior year and a 25-3 mark as a junior…was a two-year letterman on his high school track team (high, triple and long jumps)…originally attended Daniel Boone High School in Reading, PA for one year…wears size 12.5 sneakers.